Over the last year and due to engaging with the OCSG I have considered safety and rescue issues a bit more. Which lead me to dig out of my loft this book which I purchased some years ago when I was more into kayaking. 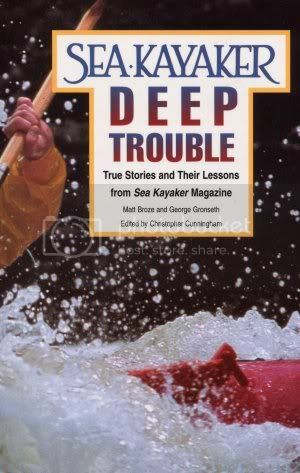 It makes for very informative reading and I think can relate to aspects of exposed canoe sailing quite well even though the events it relates are in the Pacific Northwest so hopefully some issuess won't be relevant like having your canoe attacked by a great white or having a glacier calving off on top of you. But what it will enforce in you is the foolhardiness of not wearing a PDF or some type of wet/dry suit in cold seas. Anyone got any other or better book suggestions? I have this similar book on canoeing by Doug McKown http://www.amazon.com/Up-Creek-Stori...2093877&sr=1-1 Some very interesting stories for sure!